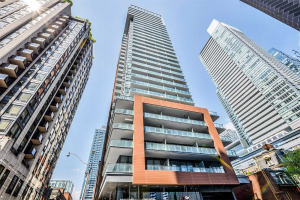 Rarely Available 1 Bed Condo Townhouse At Gallery-City Place. 668 Sq Ft Living Space Plus Large Terrace Overlooking Courtyard And Fountain. Separate Entrance From Terrace Or Building. Main Floor Living Area With W/O To Terrace And Separate Entrance. Upstairs Bath And Bedroom Overlooking Entrance And 2nd Entrance To Hallway. The Feel Of A Small Townhome And Convenience And Facilities Of A Condo. Fridge, Stove, Dishwasher, Microwave, Washer/Dryer. All Elfs Window Coverings And Broadloom Where Laid.